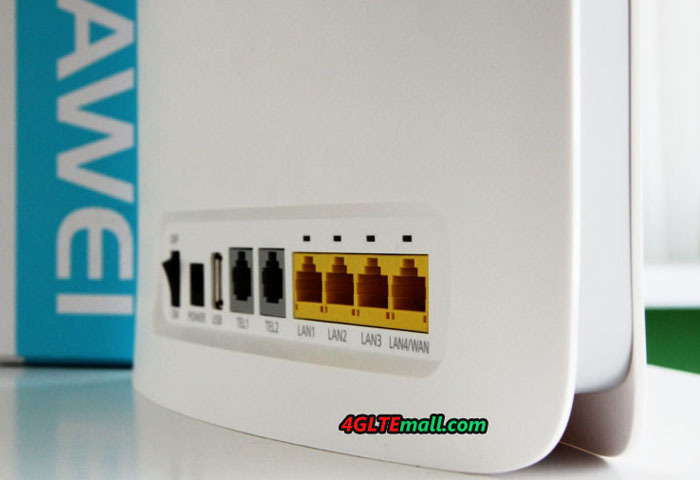 As the top telecom equipment supplier, Huawei 4G Routers are very popular in many countries based on high quality and stable performance for internet connection. And we also find some huawei wireless routers have similar specifications, i.e they support same LTE category, same LTE download speed etc. 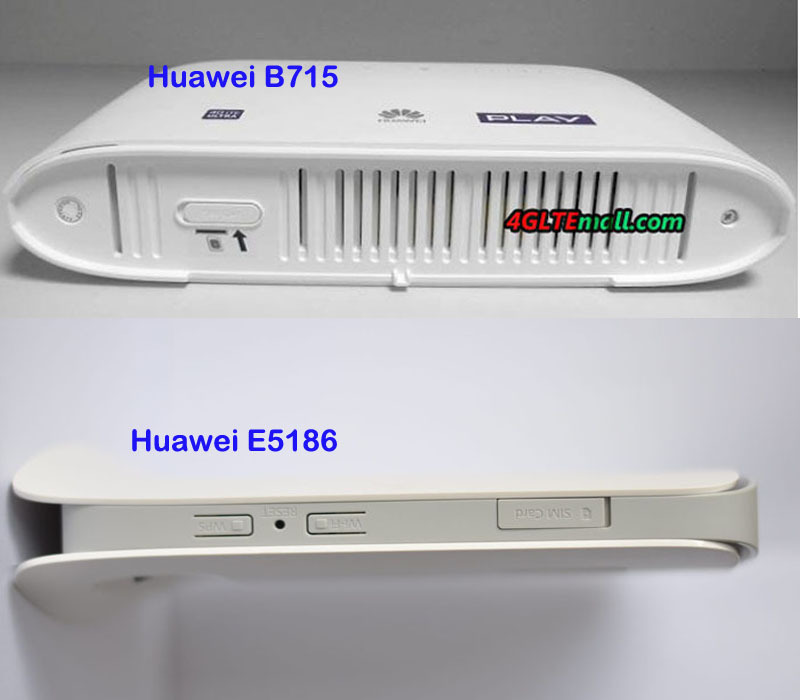 For example, we found Huawei had presented the LTE cat.6 routers such as Huawei B525 (new model) and E5186 (old model). 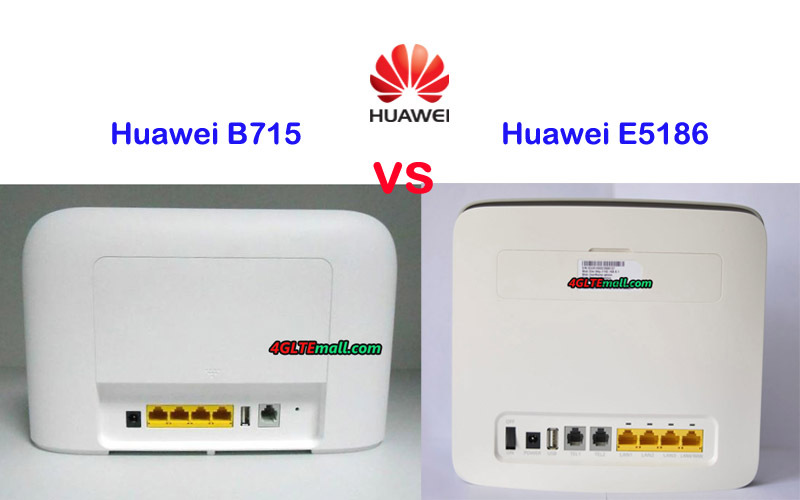 Those who want to buy Huawei 4G LTE cat6 routers may feel confused which one to choose because they are too similar. 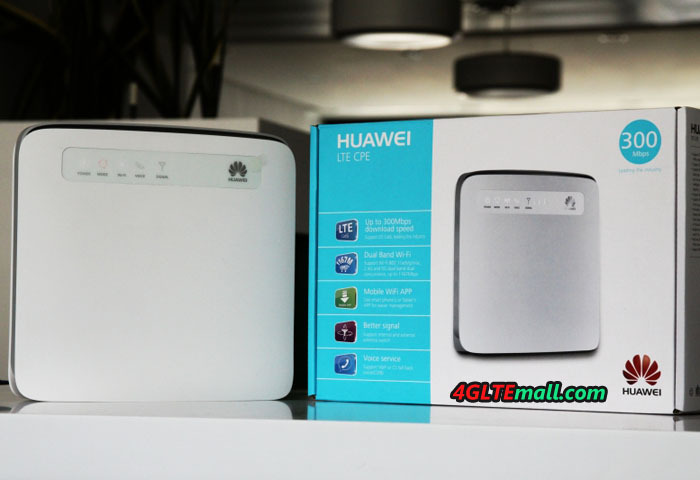 Today, we will have a look at what’s the difference between the two Huawei LTE routers. Huawei E5186 and B525 are both 4G LTE Wireless router supporting LTE CAT6, which means they both could achieve LTE download speed to 300mbps and upload speed to 50mbps technically. As the old model, huawei E5186 had been available for almost two years and very popular in Europe and Australia. The Huawei B525 was just available from second half of 2017. 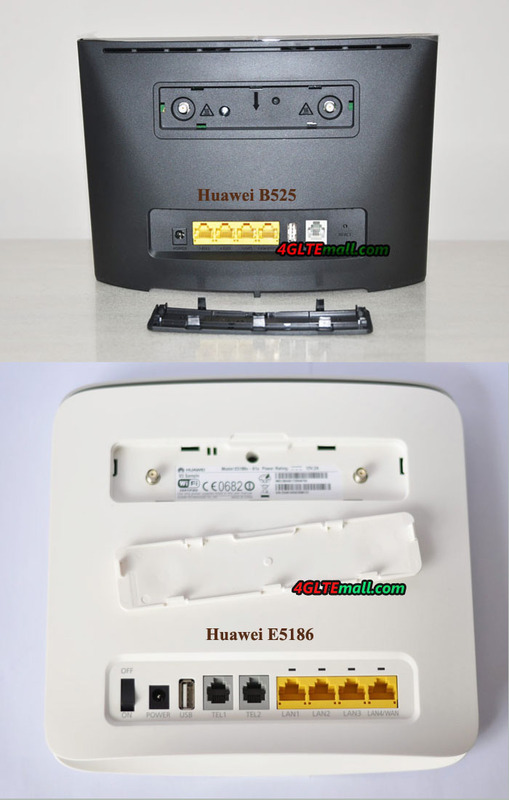 Here now in the market, the most popular model for the two Huawei routers are Huawei B525s-23a and Huawei E5186s-22a. They cover the most common LTE frequency bands in Europe, Middle East and Asia. 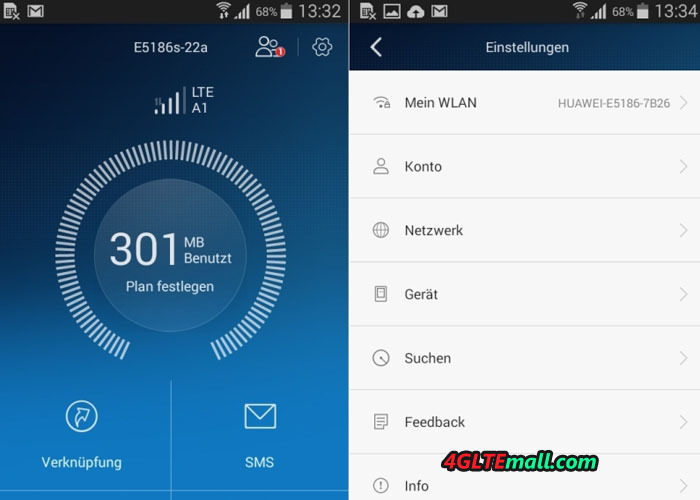 With support of LTE band 32, B525s-23a is more up to date than E5186. However, they both work for LTE-A network and have Ethernet interfaces for WAN & LAN. 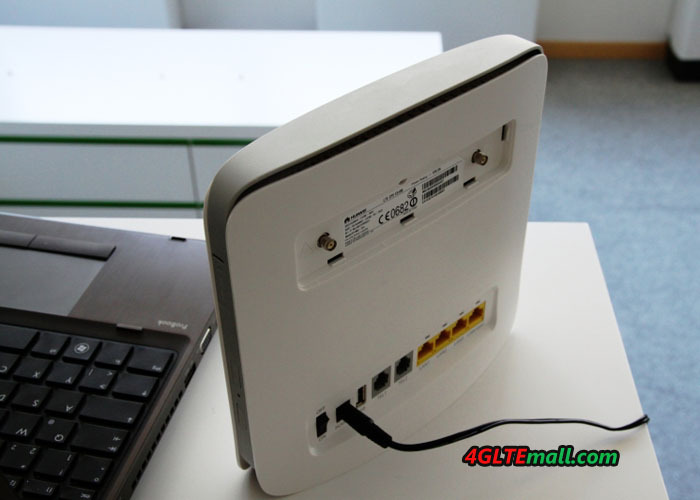 And as the typical feature for 4G LTE Routers, they both have the SIM card slot. So they are both 4G WiFi Routers with SIM card slot and Ethernet port. 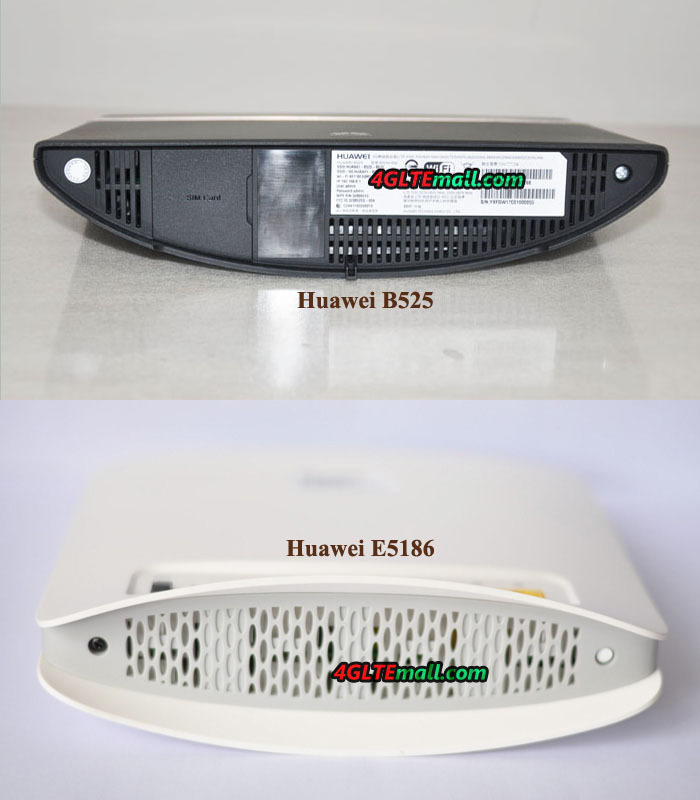 Huawei B525 is the most recent desktop LTE gateway from Huawei, which is in littler size than E5186. With the measurement of 163 mm x 52 mm x 226 mm, there are control, Wi-Fi, flag quality, organize mode and LAN/WAN marker at the front board of the B525. At the back interface of the B525, there are 4 x RJ45 ports for WAN/LAN, 1 x RJ11 port, 1 x USB port and power connector plug. Furthermore, there are additionally two connectors for external antennas. Regarding the Huawei E5186, the dimension is 194 x 177 x 64 mm, and there are control, arrange mode, WiFi, voice and flag pointers on the front board. Two SMA connectors for external antenna, 4 x RJ45 ports for WAN/LAN, 2 x RJ11 ports for VoLTE and phone, 1 x USB port for capacity and power connector plug are located in a line. From the appearance, we could get little contrast from the B525 and E5186, one is with 1 RJ45 port, and the other is with 2 RJ45 port. If you prefer black color, Huawei B525 has black color available. Huawei E5186 has only white color available. From the appearance, we can’t see what the real difference is. To be perfectly honest, for single client who needs to purchase Huawei LTE CPE, they both could do well. One could fully replace the other. The band bolt is supported by Huawei B525, which can’t discover in LTE CPE E5186. That implies you could run the B525 to a particular frequency bands from the setup menu of web UI. This is a helpful element when the administrator wants to select preferred network frequency to surf internet. Huawei B525 supports L2TP VPN setting. At the point when L2TP VPN is enabled, the throughput execution will back off, the maximum speed can up to 50Mbps (subject to network environment). On this point, Huawei E5186 doesn’t have such feature. For all Huawei LTE CPEs, there are diverse sub-variant models for various network frequency bands and carriers. 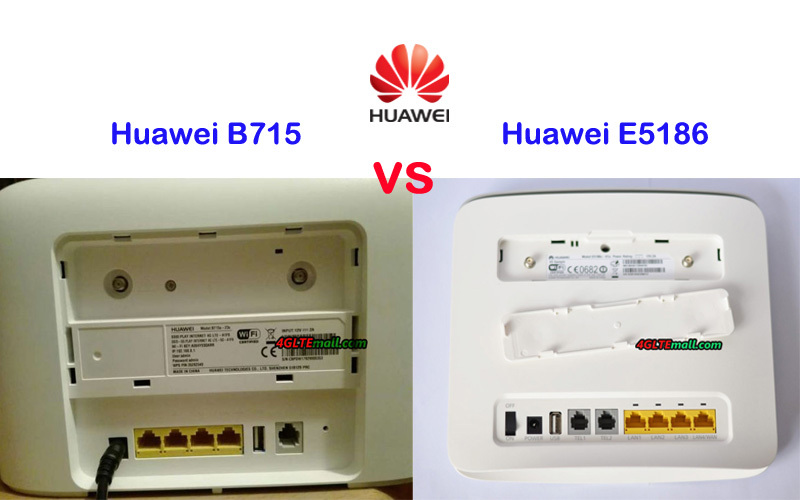 For Huawei E5186, there are two adaptations accessible: E5186s-61a (Band 3/7/28/40) and E5186S-22a (Band 1/3/7/8/20/38). 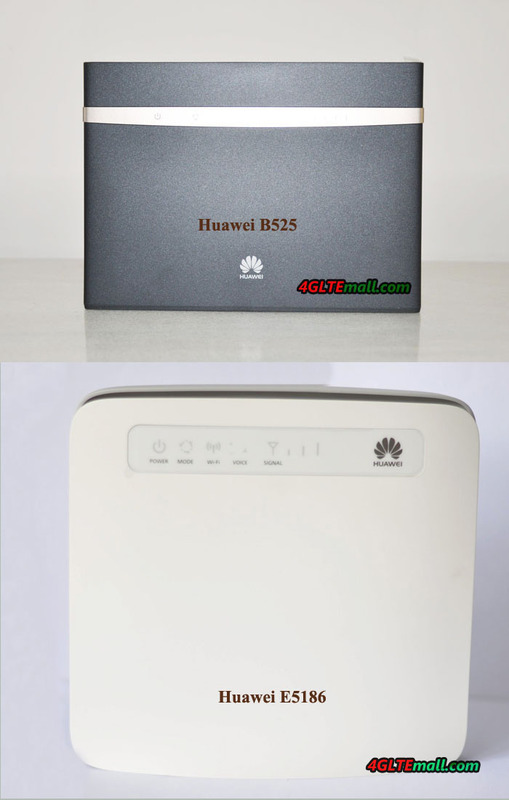 The new model Huawei B525, provides the most well known sub-models B525s-23a (Band 1/3/7/8/20/32/38), in addition to Huawei B525s-65a (Band 1/3/5/7/8/19/20/26/28/38/40/41 FDD1700/1400mhz) and Huawei B525s-95a (supported LTE bands unknown now). 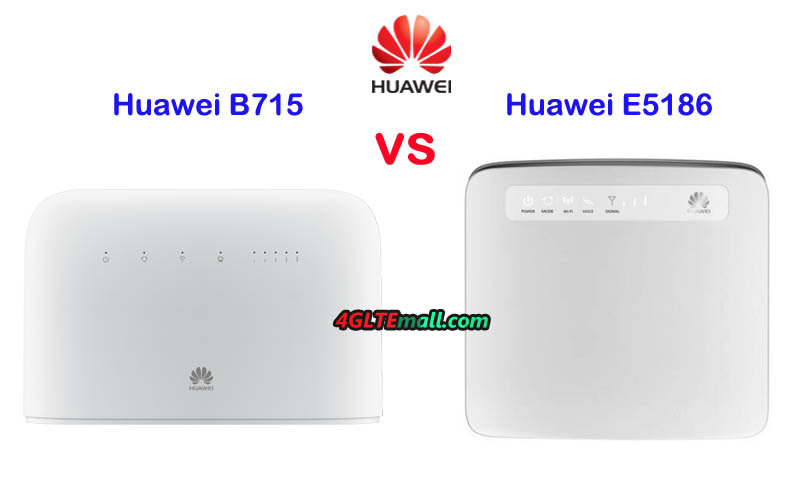 From the sub variants, we can see that the B525 seems more powerful on the LTE bands support than that of E5186, which means Huawei B525 could be used more widely with more network providers. From the appearance and technical features, we can there are some difference between the Huawei E5186 and B525. However, for most users, the different features may not influence the usage of the Huawei LTE router. And even Huawei B525 is newer model with new features, the Huawei B525 price is not as good as Huawei E5186, which is also an important factor for users to consider. But if you need to purchase band 32 CPE, Huawei B525 is the right model. In summary, huawei B525 is newer with more feature and powerful, but with higher price. Huawei E5186 has decent functions for common use, if you don’t have specific requirements, the lower price may be attracting. The first LTE Cat6 router Huawei E5186 arrived available for A1. Thanks to the introduction of LTE Carrier Aggregation at the end of June 2015, so that bandwidth of up to 300 Mbit/s can be achieved. Thus, the Huawei E5186 router with appropriate tariff is ideal for work/surfing/games at home. The model number is huawei E5186s-22a, as we know, there is brother model Huawei E5186s-61a, which is for Australian market. If you are interested in the performance of this router, it’s necessary to see this test below. In an unspectacular packaging, we find the E5186 router, a power cable, a LAN cable and a Quick Start Guide. In the brief instructions, we will discuss on the importance of the lamp, the connections and the installation of the SIM card. 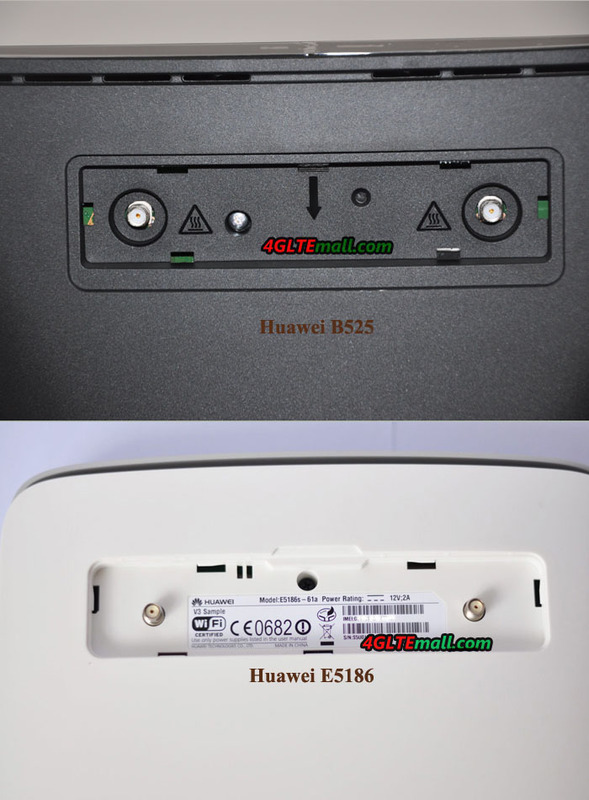 The Huawei E5186 router size is not smalle, dimensions are 194 x 177 x 64mm and lack of battery for stationary use. On the front, we find LEDs that indicate the current operating status. The air vents are designed on the top and bottom. When working, the router is not hot, thanks to passive cooling, there is also no noise. On the back we find a whole range of connections. In addition to the power connector, there is a USB port (for a network printer and USB Storage), 2 telephone lines and 4x Gigabit LAN ports. 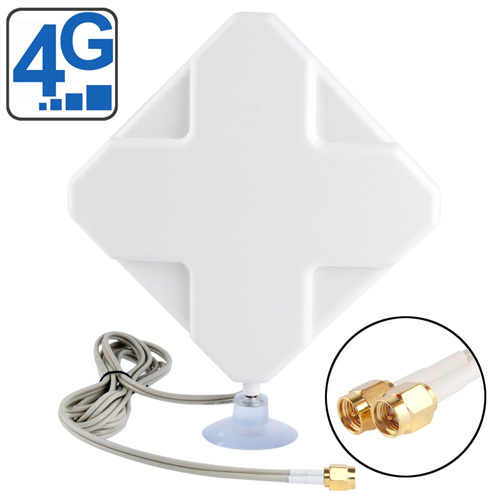 Behind the white panel, there is also the possibility to connect an antenna for better reception. 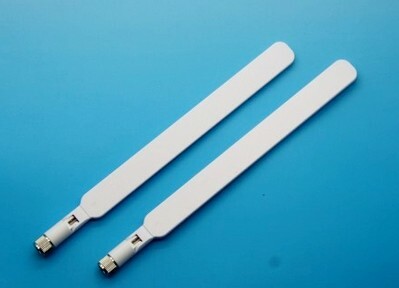 If you want external antenna for Huawei E5186, we will recommend two antennas for your consideration. The micro-SIM card is inserted on the right side of body. It’s simple to operate the E5186 LTE CPE: After insertion of SIM card and activation of the Power switch in the router, it would be connected with the mobile network after about 30 seconds. The Huawei E5186 router itself, brings the configuration of the connection automatically, manual input is unnecessary. And then other terminals can connect the WiFi and surf after the router connected with network. Those who then want to change the wireless network password or other settings, can do that on the router interface. The makes a very neat impression and you find yourself good at it rightly. 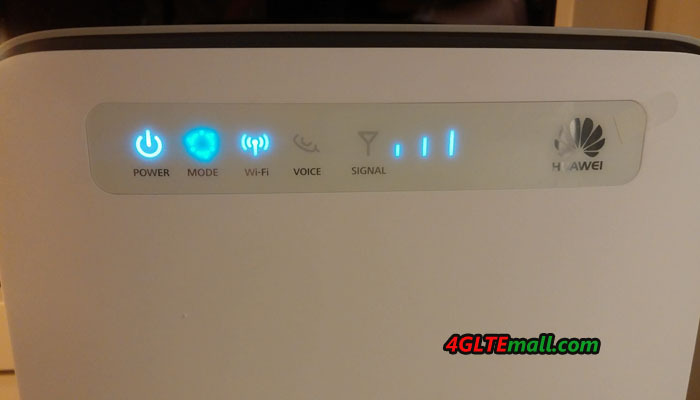 Huawei E5186 router offers the classic configuration via browser while there is another way to do the settings: The Huawei Mobile WiFi app. The app can be installed to the mobile phones or tablets by means of a clear user interface and wireless network settings. Here, you can see the Huawei E5186 router technical features: It offers all common standards with WiFi 802.11b/g/n/ac at 2.4GHz / 5GHz Dual Band and supports up to 64 devices. The range of the wireless network is about 250 meters (without obstacles), the possible bandwidth is up to 1.1 Gbit/s. This is the WiFi standard 802.11ac including simultaneous use of 5 and 2.4 GHz bands. In order to exploit the full speed, you need a corresponding network environment. The Huawei E5186 4G/LTE router supports mentioned LTE Cat6, and thus enabling download speed of up to 300Mbit/s. Of course, it also supports all other standards, so LTE Cat4, HSDPA (Dual Cell) and EDGE or GRPS. The range was great in the practical test: I have measured 80 Mbit/s with LTE Carrier Aggregation without that latency. Surfing speed was particularly impressive. Since LTE provides really good value! 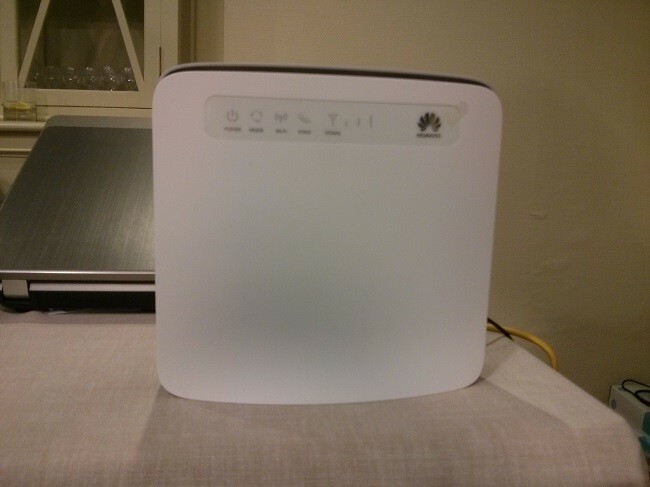 For those who need fast Internet at home or a more remote region, we can recommend the Huawei E5186 router: it is ready to go, offers a number of setting options and a very stable and fast wireless internet. As a result, the E5186 LTE router is not only suitable for working or surfing, but also to play. But this also depends on the network coverage. The LTE Cat6 are already covered in more and more cities over the world and LTE latencies are generally low. We suppose the Huawei E5186 is a future proof LTE Wireless router, it’s worthy to buy! If you ask whether there is similar LTE Cat6 router, there is still Huawei router to recommend. The model number is Huawei E5175. It’s a brother model like E5786, but not well-known. The Huawei E5186 has some OEM version at the leading LTE vendors. 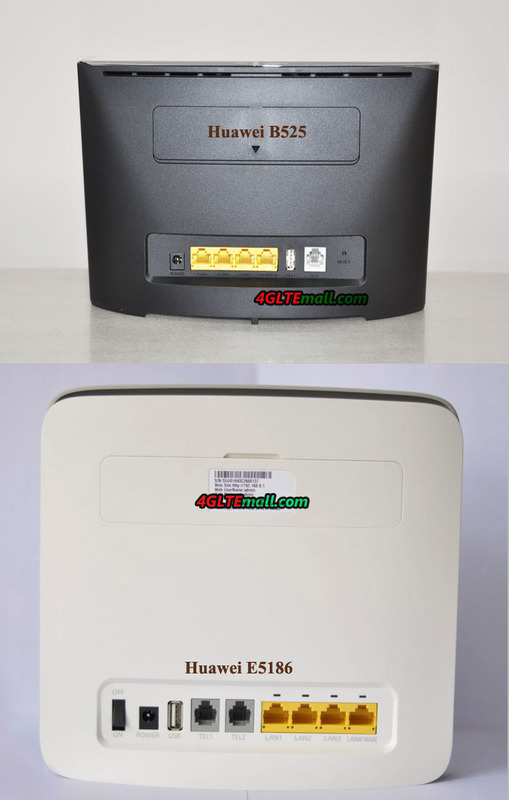 Vodafone will soon release the B4000 LTE Gateway with Vodafone logo. 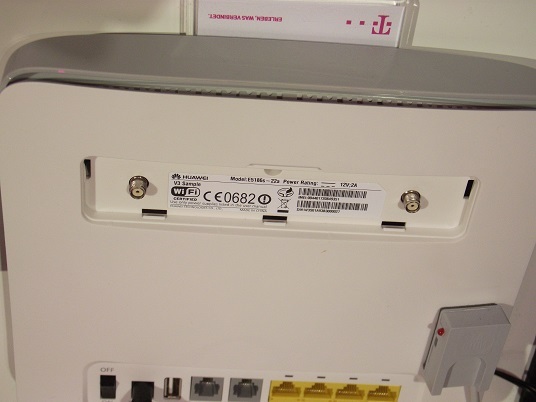 Probably the Telekom will use the device, but it is not yet known. Here now the E5186 is already available on www.4gltemall.com. If you want it, you could have a check.